NEW LISTING! Scallop Cove is a new construction home located in Copano Ridge. 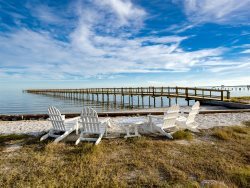 Scallop Cove has beautiful views of Copano Harbor, and access to lots of fun. This is a dog friendly home with a spacious backyard, picnic tables, BBQ grill, and 17 foot fishing dock. This is a great area for fishing. Sleeping up to 10 people, this home is perfect for a family vacation or getaway with your friends. You can leave the stresses of parking behind as there is a garage and a huge driveway. This two story house has four spacious bedrooms and three bathrooms. You will never leave the beach with the ocean colored master bedroom and its king sized bed, hard wood floors, TV, and connecting bathroom. The bathroom has a walk in shower as well as a huge tub. There is also a second downstairs bathroom with a walk in shower. The second bedroom has a queen size bed with a TV, and the third bedroom has a king sized bed. Both bedrooms are upstairs. The fourth bedroom is upstairs and the perfect kids room with four brightly colored twin sized beds that they will be sure to love. The last bathroom is upstairs with a walk in shower and coastal themed décor. Their team was very easy to work with and very pleasant. This the third time we have been and always well maintained and clean.